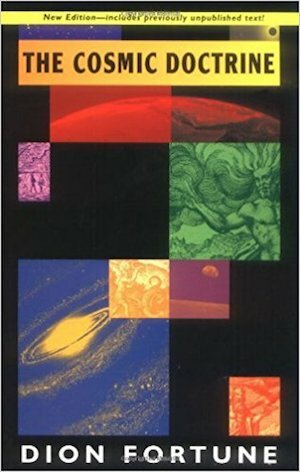 June 13, 2018 (EcoSophia.net) -- With this post we begin a monthly discussion of The Cosmic Doctrine by Dion Fortune, which I consider the most important work of 20th-century occult philosophy. Climb in and fasten your belts; it’s going to be a wild ride. As noted in earlier posts here, there are two widely available editions of The Cosmic Doctrine, the revised edition first published in 1966 and the Millennium Edition first published in 1995, which reprints the original privately printed edition of 1949. You can use either one for the discussions that follow. The text varies somewhat between the two editions, but the concepts and images are the same, and I’ll be referring to both. Revised Edition: Chapter 1, “The Dawn of Manifestation,” p. 11-13. Millennium Edition: Chapter 1, “The First Manifestation,” p. 19 through the first (partial) paragraph on p. 22. Before we launch into the text, a couple of notes may be helpful. First, for those readers who haven’t tackled a work of philosophy before, this is not light reading. You know the habits of reading you use when you’re reading for pleasure -- reading quickly and uncritically, letting the words weave someone else’s daydreams in your mind? That will emphatically not cut it here. Second, this is a work of occult philosophy. It’s meant to teach you how to think in ways that don’t come naturally to the untrained mind. What’s more, everything you’ve absorbed from the habitual mental chatter of our society might as well be designed to stop you from thinking the way this book is meant to teach you to think. The habits of thinking taught by the habitual mental chatter of society also have their place, but if that’s the only kind of thinking you know how to do, you’re stuck with a very narrow range of cognitive options. The Cosmic Doctrine will give you a much more extensive mental toolkit, and there are things you can do with it that you can’t do at all from within the stifling confines of modern materialist thinking. To get anything at all out of The Cosmic Doctrine, though, you’re going to have to work at it, and stretch your mind in ways it may not like stretching at first. The comparison with physical exercise is a useful one: if you happen to be out of shape, your first workout is going to leave you feeling pretty uncomfortable, but if you persevere you’ll get past that discomfort and gain both enjoyment and a significant increase in health and strength. The method this book uses to teach you how to think unfamiliar thoughts is one that was once very common in occult literature, though it’s fallen out of fashion in recent decades. “In these occult teachings,” says our text, “you will be given certain images, under which you are instructed to think of certain things. These images are not descriptive but symbolic, and are designed to train the mind, not to inform it.” If you’ve ever wondered why books of alchemy show enigmatic images and follow them with equally cryptic text, or why Manly P. Hall’s famous The Secret Teachings of All Ages starts each chapter with an elaborate color plate which may or may not have anything obvious to do with the topic of the chapter -- well, now you know. The images in The Cosmic Doctrine aren’t presented in the form of lavishly illustrated color plates, and there’s a reason for that. Remember that this book was originally privately published, and issued only to members of Dion Fortune’s magical order, the Fraternity (now Society) of the Inner Light, as an aid to training. Being able to imagine things clearly is one of the basic skills of the operative mage. Whether or not you have that skill now is immaterial. As with anything else, you get it by practicing, and The Cosmic Doctrine will give you plenty of that. Let’s begin. Take the paragraph at the beginning of the chapter (paragraph 3 of the Millennium edition) that begins “The Unmanifest is pure existence.” Read through it once quickly, to get the general shape of it, then again, slowly, thinking through each sentence. If you’re puzzled by some of it, or even by all of it, that’s a sign that you’re paying attention! Now follow the advice of the last sentence in the paragraph. Spend a while imagining interstellar space: pure empty vastness without stars or planets. Now go through a few sentences of the paragraph, keeping the image of interstellar space in mind. At every point, refer the thoughts back to the image. As you do -- and it may happen quickly, or it may take repeated effort -- you’ll begin to get a clearer sense of what the text is saying about the Unmanifest. One useful way to think about philosophies is to count how many basic realities they posit at the foundation of existence. Usually the headcount of realities comes to 0, 1, or 2. Philosophies that opt for 0, which we can call nihilist philosophies, see all apparent things as mere illusion and the sole reality as the void. Philosophiles that opt for 1, monist philosophies, see the universe in terms of some single “stuff” of which all things are modifications. Philosophies that opt for 2, dualist philosophies, hold that there are two kinds of “stuff” out of which all things are made -- for example, spirit and matter. Fortune falls squarely in the monist camp -- but it’s monism with a twist. For her, there’s one fundamental “stuff,” the Unmanifest, but its characteristics make it resemble the void that’s the ultimate reality according to nihilist philosophies. The Unmanifest is, but its mode of being is so unimaginable to us that we can best think of it as the closest thing to nonbeing any of us can imagine, the empty vastness of interstellar space. Is this true? Is the Unmanifest actually the basis for everything that we experience? Ahem. “These images are not descriptive but symbolic, and are designed to train the mind, not to inform it.” It’s one of the more embarrassing examples of human hubris to think that our brains, which evolved for such intellectually undemanding tasks as finding food and mates on the East African savanna, are capable of understanding the foundations of existence itself. This is why philosophy presents us, not with One True Answer, but with a variety of accounts of the world, some of which are more useful for certain purposes or more congenial to certain personalities than others. The Cosmic Doctrine is one account: an account very useful for certain purposes. What these purposes are will be discussed in in more detail as we go. “The Unmanifest is the only Unity,” our text goes on to say. “Manifestation begins when duality occurs.” Duality -- or, to give it another name, polarity -- is the most important theme in The Cosmic Doctrine. The short paragraphs that follow outline our first sketch of polarity, by way of the usual interplay of image and idea. Imagine interstellar space, and then imagine some of it beginning to flow, forming a current -- a current of space, in space, moving through space from space to space. Now imagine the two forces playing on the movement -- the slightly stronger desire of space for momentum and the slightly weaker desire of space for inertia; imagine the second force pulling slightly on the first, making it curve; imagine the curve extended over immense distances until the current becomes a vast ring -- the Ring-Cosmos. There’s your second image. The paragraphs that describe the formation of the Ring-Cosmos give you the ideas to think about under that image. All this is metaphor, as the text says; put another way, it’s one account of the basic nature of things. Notice what it implies: that every act of creation unfolds from the intersection of two opposite and unequal forces. This last point can be developed at very great length. In his book The Power of Limits, the architect and sacred geometer Györgi Doczi gave this interplay of opposed unequal forces the name “dinergy,” and showed that beauty and creativity in nature and human art can best be understood as an expression of dinergy. Look at the exquisite arc made by a blade of grass bending in the wind: the arc comes into being from the interplay of the force of the wind and the weaker but still significant resistance of the grass. That’s dinergy -- and it’s also what Fortune is talking about, as the two forces transform a current in space into a Ring-Cosmos. With that in mind, let’s go back to our text. Once the Ring-Cosmos is established, it begins to draw more empty space into its flow, and the Ring-Cosmos turns into a spinning disk. Think of it as the spinning wheel in a gyroscope, or an old-fashioned vinyl record spinning on a turntable. As it spins, it sets up stresses in the empty space beyond its outer edge, and those stresses eventually set another current of space in motion at right angles to the original current. If you picture the Ring-Cosmos as spinning horizontally, like an LP on a turntable, imagine the second current starting out vertically from a space out beyond one edge of the Ring-Cosmos. The same paired forces have the same effect on the second current as on the first, so it curves as it flows, arcing over the Ring-Cosmos, descending vertically past it off beyond its far side, and then circling back beneath the Ring-Cosmos to return to its starting point. That gives you two rings: the Ring-Cosmos and the Ring-Chaos, spinning at right angles to each other. The Ring-Cosmos is a disk, the Ring-Chaos is a ring outside the disk at right angles to the plane in which the disk spins -- all, as our text says, to the nearest approximate metaphor. (“These images are not descriptive but symbolic…”) Once again we have a polarity, just as we did when space first started flowing…and once again the dinergy between the two opposed but unequal forces gives rise to something new. In the metaphor Fortune uses, “something new” is represented by movement. What happens, in the metaphor, is that the Ring-Cosmos begins to pivot. Our text asks you to visualize the disk of the Ring-Cosmos as having an upper and a lower surface, and the upper surface on the outgoing arc (the first half of the original Ring-Cosmos, which it made by flowing away from its starting point) is attracted to the Ring-Chaos, while the lower surface is repelled by the Ring-Chaos; on the incoming arc, the attraction and repulsion are arranged the other way. This is metaphor, again, but it has quite a bit to teach; it’s not only in cosmological metaphors, after all, that every attraction is balanced by a repulsion and every repulsion by an attraction, and that these alternate at various points of any creative process. I’ve found that some students have a hard time visualizing the third movement that results, so we’ll shift metaphors a bit. Imagine the Ring-Cosmos as a flat horizontal disk of metal. Imagine the Ring-Chaos as a ring of metal larger than the disk, positioned vertically so that the disk fits inside it, and the two touch at two points, where the ring passes just outside the disk. Imagine that the ring and the disk are connected at those two points by a pair of pins on which the disk can pivot. Now imagine the disk pivoting on those pins, one side rising up, the other dipping down, until the disk is in the same vertical plane as the ring -- but the disk keeps pivoting, so that the side that rose is now dipping and that which dipped begins to rise. The disk moves faster and faster, and as it moves, its outer edge traces a sphere. That sphere is the Ring-Pass-Not, the third of the Rings that define a Cosmos. The Ring-Cosmos is primary; the Ring-Chaos takes shape in response to it, as a function of the resistance of space; the Ring-Pass-Not takes shape out of the interaction between the other two rings, as a function of their mutual attraction and repulsion. Spend some time imagining the whole process as clearly as you can, all the way from the first movement of space to the formation of the Ring-Pass-Not. Then imagine it again, and think through each part of the text that describes the process, until you have some sense of how it all works. Then apply what you’ve learned to something else -- say, an interaction between two people. The Ring-Cosmos is set in motion by the initial action that brings them into contact. The Ring-Chaos is set in motion by the initial reaction to that first action. Over time, the interplay between action and reaction leads to the creation of a boundary -- the Ring-Pass-Not -- that defines the interplay between them. In the language of systems theory, these are action, reaction, and equilibrium; in the traditions of the Cabala, they are the three pillars of Force, Form, and Balance; in the symbolism of Masonry, they are the three pillars of Strength, Wisdom, and Beauty. Other symbolic systems have their own ways of talking about the same things. It’s crucial to understand the relative roles of the Ring-Cosmos and Ring-Chaos, and Fortune uses a deft bit of discussion to help you grasp that. The last paragraph of the chapter -- in the Millennium Edition, this is the last paragraph on page 21, spilling over onto page 22 -- is the one to follow here. (In both, it begins “The secondary spin of the Ring-Pass-Not…”) Here Fortune assigns several descriptive labels to the Ring-Chaos. It’s the prime stillness of the cosmos; it’s the thrust-block that resists the force of the Cosmos; finally, it’s the Prime Evil. The pun here (“primeval”) is quite deliberate, of course, but so is the moral reference. From within the boundary of the Ring-Pass-Not, the Ring-Chaos represents everything the Cosmos is not; it represents the primal void out of which the Cosmos takes shape. It represents these things, but it is not these things. The Ring-Chaos, remember, comes into being after the Ring-Cosmos, and in relation to it. It is the reaction to its action, the pushback of the Unmanifest against that first movement of flowing space and everything that unfolds from it. That pushback is also the original form of what we call evil. The question of evil has bedeviled philosophers for a very long time. It’s especially challenging for thinkers who are committed to those monotheist faiths that claim the universe was created by one and only one almighty, omniscient, and infinitely loving deity; a vast number of unsatisfactory arguments have been deployed to try to explain why such a deity would have created a world as well-stocked with misery and brutality as the one we experience. The Cosmic Doctrine, as we’ll see, does not posit such a deity, but it also proposes a distinctive vision of the purpose of evil. Evil, in Fortune’s account, is a thrust-block. It’s the thing we resist and push off from in order to go somewhere else and do something else. The nature of evil, and the ways that the initiate uses it as a way to get traction, will be discussed in quite a bit more detail in the chapters ahead, and this will also involve an exploration of the difference between evil as inertia (“negative evil”) and evil as actions on the part of conscious entities that follow the current of the Ring-Chaos rather than the Ring-Cosmos (“positive evil”). The point to take away at this point is that evil is the friction exerted by the Unmanifest, the resistance that allows action to happen. As already noted, The Cosmic Doctrine is heavy going, especially for those who don’t have any previous exposure to occult philosophy. It’s useful to read through the assigned chapter once or twice, trying to get an overview, but after that take it a bit at a time. The best option for most people seems to be to set aside five or ten minutes a day during the month you spend on this chapter. During that daily session, take one short paragraph or half of a long one, read it closely, and think about what you’ve read, while picturing in your mind’s eye the image you’ve been given for that passage of text. Questions and comments can also be posted here for discussion. (I’d like to ask that only questions and comments relevant to The Cosmic Doctrine be posted here, to help keep things on topic.) We’ll go on to the next piece of the text on July 11. Until then, have at it! 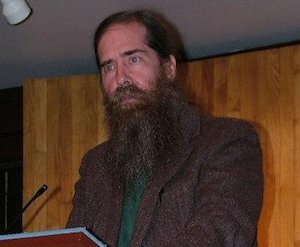 John Michael GreerJohn Michael Greer is a widely read author and blogger whose work focuses on the overlaps between ecology, spirituality, and the future of industrial society. He served 12 as Grand Archdruid of the Ancient Order of Druids in America, and currently heads the Druidical Order of the Golden Dawn. He currently lives in East Providence, Rhode Island, with his wife Sara.